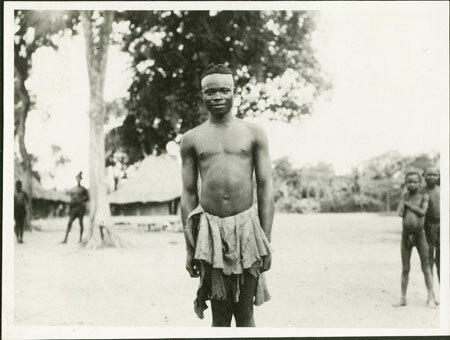 Portrait of a youth (unidentified) wearing barkcloth and hair shaved at the temples, photographed in the public area of Prince Gangura's compound where his court of justice was located, called the ngbanga. Notes on print/mount - "46 (+128) EPA 583"
Morton, Chris. "Portrait of a Zande youth" Southern Sudan Project (in development). 03 Jan. 2006. Pitt Rivers Museum. <http://southernsudan.prm.ox.ac.uk/details/1998.341.583.2/>.